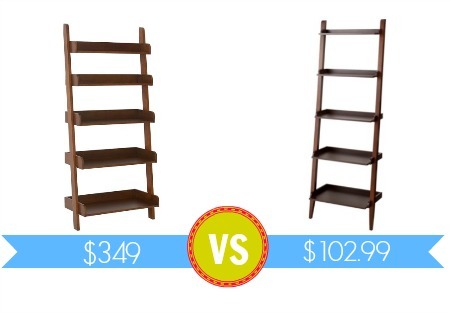 Wall shelves have been a big trend recently. They add an interesting spin on your average bookcase. I posted similar Look Alike a few weeks ago – a bathroom storage ladder. This one is made completely of wood and is better suited in a living room or bedroom. This Studio Wall Shelf would be perfect for your books, knick knacks, or even to prop on the wall right next to your bed as a bedside table. 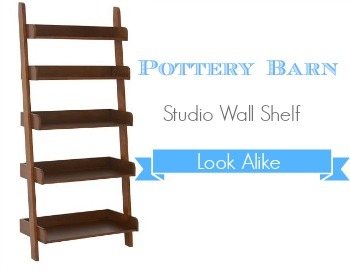 The Threshold bookcase looks very similar to the Pottery Barn version with exactly the same function. The good news is, Target has many different versions of this bookshelf in higher and lower qualities. The bookcase above is the closest version I could find to the Studio Wall Shelf at the best price. You can find even more options below according to your budget. Check out more frugal look alikes.